Exterior work on the West Towns made great strides through the month of August. Masonry installation was completed on the east face of the southernmost block of townhouses and is now continuing northward. Exterior cladding on the upper levels of the townhouse is substantially complete along the Perth Avenue frontage. Framing of the 32 private garages, located on the west side of each of the townhouse units, is substantially complete. Remaining work on the garages, including waterproofing and roofing, will continue into September. Future residents will access these private garages via a paved private laneway that connects to Perth Avenue. The construction of the barrier wall along the western property line is near complete, with only one section remaining to be finished at the northen edge of the site. This wall acts as a barrier to the rail corridor. Work on the interiors of the townhouses continues to progress. Interior walls and staircases are substanially complete. Drywall and finishing work on the interiors will continue through September. NOTE: Municipal servicing work is now expected in September. Once we have a firm schedule for the servicing work, we will circulate a printed notice and post the information on the project website. Finishing work on the east elevation of the Auto Building (fronting Sterling Road) made steady progress through the month of August. Landscaping work along the Sterling Road frontage will continue into the first week of September. Work on the canopy over the main Sterling Road entrance is advancing well. The steel frame for the canopy has been installed and the glass elements are expected to be installed in the coming days. The installation of exterior cladding and insulation on the external freight elevator, located on the north side of the Auto Building, will continue into early September. This elevator is a museum-standard (climate controlled) freight elevator that serves the first three floors of the Museum. Interior finishing is substantially complete inside the two new glass additions on the west side of the heritage building. The glass additions will provide access to both the lobby area on the ground floor and to MOCA’s ground floor café. Remaining finishing work is close to completion on the main floor of the building in preparation for the Museum of Contemporary Art Toronto Canada (MOCA)’s international opening on September 22nd. Building, is scheduled to get underway shortly. This service lane will provide loading, delivery and drop off access to MOCA and the commercial offices. Exterior work on the West Towns continues to progress well. Masonry installation will soon be complete on the east face of the southernmost block of townhouses and will continue northward over the coming weeks. Exterior cladding for the upper levels of the townhouses continues to be installed and is clearly visible from Perth Avenue. 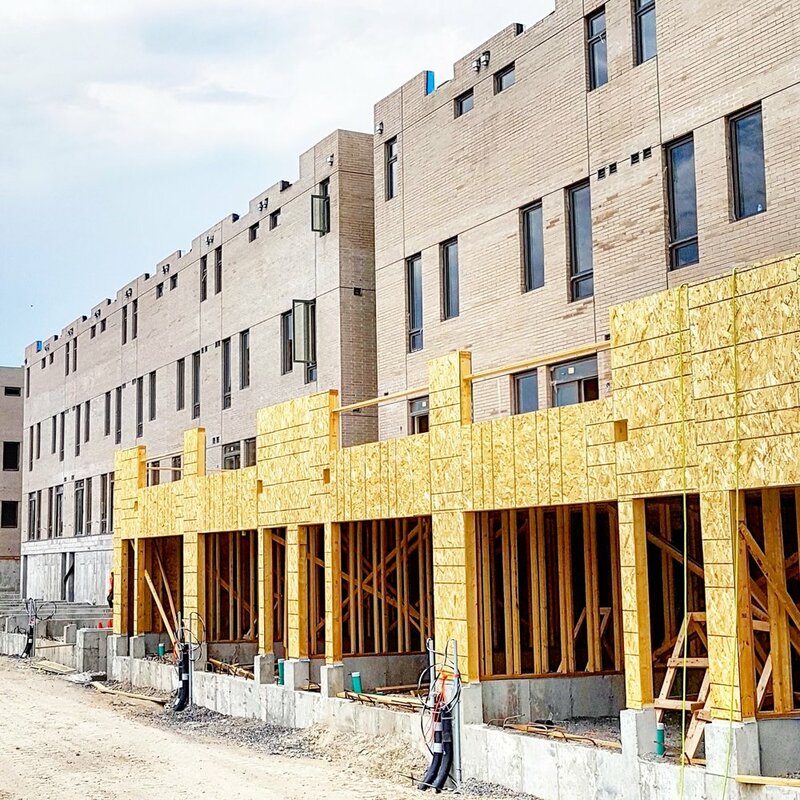 Construction of the garages is progressing steadily; with framing complete on the two northern and the southernmost blocks of the townhouses. Garage work will begin soon on the balance of the townhouse blocks. The roofs of the northern garages are now being waterproofed. Future residents will access these private garages via a paved private laneway that connects to Perth Avenue. Over the next two to three weeks preparation work for the barrier wall on the western edge of the property will be underway. The barrier wall will be completed by months end September. The wall will separate the West Towns from the West Toronto Railpath and act as a barrier to the rail corridor. Work on the interiors of the townhouses is also making steady progress; interior walls and staircases are near completion. Drywall and finishing work on the interiors will continue through the balance of the summer. Finishing work on the east elevation of the Auto Building (fronting Sterling Road) is continuing with concrete and landscaping work all underway. Work will continue through August assuring the Museum of Contemporary Art Toronto Canada (MOCA)’s opening on September 22nd. Exterior cladding and insulation installation continues this month on the external freight elevator, located on the north side of the Auto Building. This elevator is a museum-standard freight elevator that serves the first three floors of the Museum. Interior finishing is substantially complete inside the two glass additions on the west side of the building. These will provide access to both the lobby area on the ground floor, and MOCA’s ground floor café. Finishing work is ongoing on the main floor. The south elevators servicing MOCA and the office levels above the gallery have all been installed. Work to complete the paving of the northern section of the paved access lane surrounding the heritage building will be underway later this month. This private paved access lane will run from Sterling Road around the western side of the Auto Building and will provide loading, delivery and drop off access to MOCA and the commercial offices. Work on the exterior of the West Towns has progressed significantly. Installation of brick masonry is now complete on the west side of three of the four blocks of townhouses. Work continues on the west side of the southern block and is progressing to the east facades, facing Perth Avenue. Construction of the garages, located on the west side of the townhouses, is underway. Future residents will access the private garages via a paved private laneway that connects to Perth Avenue. Interior work continues in the townhouses with the installation of drywall within the individual units. NOTE: Municipal servicing work is expected this summer. Once we have a firm schedule for the servicing work, we will circulate a printed notice and post the information on the project website. The new service lane around the Auto Building in now in place, with paving completed on the south and west side of the building. Paving work on the northern section of the lane is in progress. The service lane is accessed solely from Sterling Road and is designed to accommodate garbage trucks and other service vehicles for the heritage building only. As work on the Auto Building moves closer to completion, some of the restored exterior details are becoming visible, such as the north and south stairwell exits that face Sterling Road. Interior finishing is nearing completion for the two glass additions on the west side of the building. These will provide access to the lobby area on the ground floor, as well as to the Museum of Contemporary Art Toronto Canada (MOCA)’s ground floor café. Work continues on the main floor to complete the final interior finishes. The Auto Building’s original ground floor bi-folded doorways along Sterling Road have been preserved and restored. The heritage doorways have been installed along with the new exterior glass doors. Exterior brickwork is progressing steadily at the West Towns. Installation is now complete on the west side of the two northern sections of townhouses. Work will begin shortly on the two southern sections of townhouses. Soon the installation of the brick masonry will commence on the east facades, facing Perth Avenue. Work on the interiors of the townhouses continues, with finishing scheduled to for the balance of the spring and early summer. Municipal servicing work is now expected to commence late spring or early summer. As soon as the schedule for this municipal servicing work is finalized, a printed notice will be circulated to the community prior to work commencing; and a digital notification will also be posted to the project website. The new accesses road that will lead from Sterling Road to the western entrance of the Auto Building has been graded and prepared for paving. Asphalt paving is getting undereway and this roadway should be ready by the beginning of June if not before. Interior finishing is moving ahead for the two glass additions on the west side of the building. These provide access to the Museum of Contemporary Art’s café as well as the lobby areas on the ground floor. The Museum has taken possession of the 5th through 2nd floors. Work is continuing on the main floor with the completion of final finishes. The heritage doors that have been preserved have been installed along with the new glazing for the main floor entranceways. The upper floors of the Auto Building from 6 to 10 were completed have been completed to a base condition and tenants are beginning to move into them. The Museum of Contemporary Art Toronto will have its international grand opening on September 22, 2018. The current focus of construction work at the West Towns is the exterior brick masonry work. 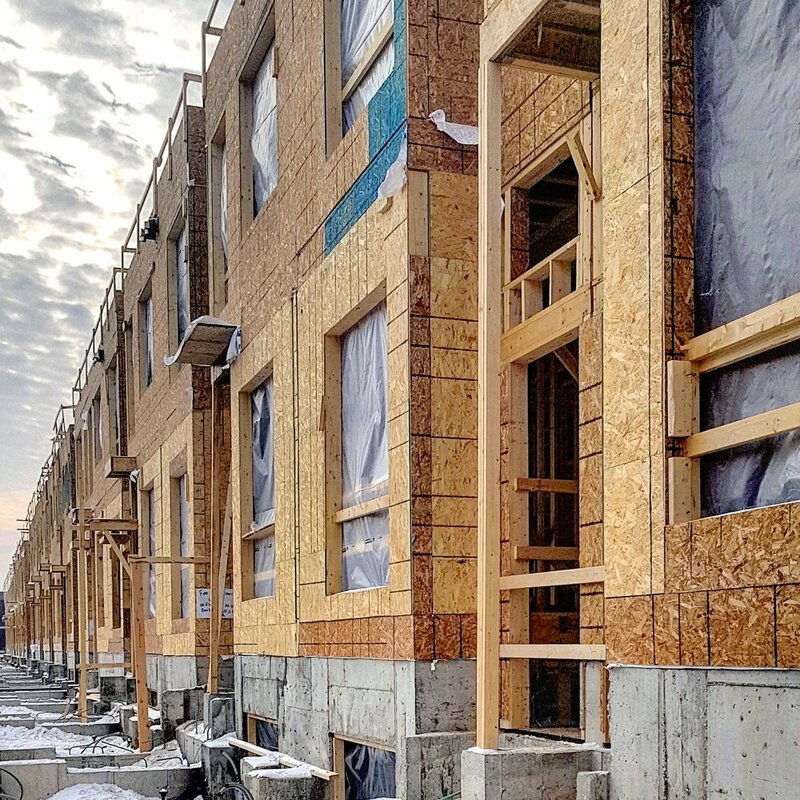 Installation is complete on the west side of the northern section of townhouses and is moving steadily south across the site. Work on the east facades will get underway in the coming weeks. The construction crew is also busy working on the interiors of the townhouses. Finishing work will continue through the spring and early summer. Work on the exterior of the Auto Building reached a new milestone with the completion of two glass additions on the west side of the building, which will provide access to the café and lobby areas on the ground floor. The construction crew is working on the finishing touches of the Museum’s gallery interiors on the ground, second and third floors. The glass partitions that frame the new entrance lobby have been installed. Drywall for the interior area of the Museum café has been installed, with only finishing work remaining to be completed. The upper floors of the Auto Building from 6 to 10 have been completed to a base condition. Final restoration work on a portion of the 9th floor slab has been completed. Tenants of floors 6 to 10 are now able to fit out their spaces to suit their needs. The Museum of Contemporary Art Toronto will be inviting the public for a sneak peak preview weekend, May 26-27, 2018, for Doors Open Toronto. The Museum’s international grand opening will be on September 22, 2018. Construction on the West Towns continues at a steady pace. Window installation across the site is now complete. Preparation for the construction of the private garages and access lane that will be located to the rear of the site has commenced. This lane will provide vehicular access for residents and will connect from Perth Avenue. Prior to occupancy, all grading and paving will be fully completed for this area. Work on the interior of the town houses is currently underway. The next phases of work will include the installation of masonry exterior, which will move from north to south across the site. Municipal servicing work is now expected to commence late spring or early summer. As soon as the schedule for this municipal servicing work is finalized, a printed and digital notice will be circulated to the community prior to work commencing. Work on the exterior of the Auto Building reached a milestone this past week with the removal of the external elevator (hoist). This is a major step forward as construction crews will now focus on completing the final elements in preparation for the official opening of the Museum of Contemporary Art Toronto on May 26th. Framing for the two glass additions, serving the ground floor café and lobby areas, along the western building face has been completed. The external glass curtain wall for the addition connecting to the lobby area has been installed. The glass addition connecting to the café space is scheduled to be installed in the coming week. The final stage of installation and testing for the Auto Building’s west elevators is underway. It is expected that these elevators will be operational within the next two weeks if not sooner. The upper floors of the Auto Building from 6 to 10 have been completed to a base condition. Final restoration work on a portion of the 9th floor slab is close to completion. Tenants of floors 6 to 10 are now able to fit out their spaces to suit their needs. Construction on the West Towns continues to move forward at a steady pace. Window installation across the site has been completed. The installation of brickwork on the west side of the townhouses is now underway. Recently, waterproofing was completed on the west side of the townhouses. Additional concrete pours to finish townhouse unit basements have also been completed. The next phases of work will include the continuation of brickwork installation followed by the installation of siding moving from north to south across the site. Currently, the north block of townhouses has an example of some of the siding that will be used to finish the exteriors. Municipal servicing work is now expected to commence in the late spring or early summer. As soon as the schedule for this municipal servicing work is finalized, both a printed and digital notice will be circulated to the community prior to work commencing. Below L - R; Photos of the near-complete interior of the Auto Building, an exterior detail shot of the West Towns, and South African Artist Kendell Geers’ BE:LIE:VE, 2002, among the works opening at MOCA on May 26th (courtesy of MOCA). Work inside and outside the Auto Building is progressing at a fast pace in anticipation of the official opening of the Museum of Contemporary Art Toronto on May 26th. The construction team expects to have floors 2 to 5 finished in the next two weeks, including completing the installation and tiling of the washroom units. Work on the main floor is also progressing well. Framing for the two glass additions, serving the ground floor café, lobby areas, and western building face, are being installed. The external glass curtain walls for these two glass additions are also currently being installed and should be completed in early April. The restoration of the basement is also near complete with only some minor finishing of the service spaces remaining to be done. The main components of the west elevators have been installed. The final elements of the elevator cabs are scheduled to be completed in early April. The upper floors of the Auto Building from 6 to 10 have been substantially completed to a base condition; some final restoration work remains to be done on a portion of the 9th floor slab. Tenants of floors 6 to 10 will be able to finish these spaces to suit their own specific needs. The museum-standard external freight elevator structure is now complete. The elevator will be installed in the coming weeks. This climate controlled exterior elevator will serve the needs of the Museum, enabling exhibit materials to be loaded in and out. REMINDER: Please join for a community update meeting re: Lower Junction and 72 Perth Avenue on Thursday, March 22nd, 6:30 pm at the Lower Junction Gallery, 213 Sterling Road, Ground Floor. Construction on the West Towns has been steady through the winter. Framing work for the townhouses has reached the third floor across the entire site. Window installation is underway in the northern half of the site. As with previous construction phases, window installation will move north to south as the work progresses. Work on the interiors of the town-homes will also be the focus of the coming weeks as window glazing is installed and the units are weather-sealed. Municipal servicing work is expected to commence over the next couple of months. As soon as the schedule for this municipal servicing work is finalized, both a printed and digital notice will be circulated to the community prior to work commencing. Auto Building – 158 Sterling Rd. Work on the Auto Building’s adaptive reuse made steady progress through February. The office and administrative spaces for the Museum of Contemporary Art Toronto on the 4th and 5th floors are substantially complete; remaining work on these floors is expected to complete in the coming weeks. Drywall installation on the exterior walls has been completed from the 2nd to the 10th floors of the building. Floors 6 to 10 (not occupied by the museum) are being finished to base condition, permitting the tenants to put their own touches on the spaces they will occupy. As we reported in our last update, the steel structure, which serves as the roof for two new glass additions along the west side of the building, has been installed. These glass additions will connect to MOCA’s ground floor café and building lobby. The curtain wall glass that will finish these spaces is expected to be installed soon. We look forward to sharing images of these exciting spaces in a future update. Construction on the West Towns has been steady through the winter so far. Framing work for the townhouses has reached the third floor across the entire site. Window installation is underway in the northern half of the site. As with previous construction phases, window installation will move north to south as the work progresses. Municipal servicing work is expected to commence in the latter part of the winter. As soon as the schedule for this municipal servicing work is finalized, both a printed and digital notice will be circulated to the community prior to work commencing. Work on the Auto Building’s adaptive reuse continues this month with a focus on finishing the interior spaces on the first 5 floors, which will serve as the new home for the Museum of Contemporary Art Toronto. 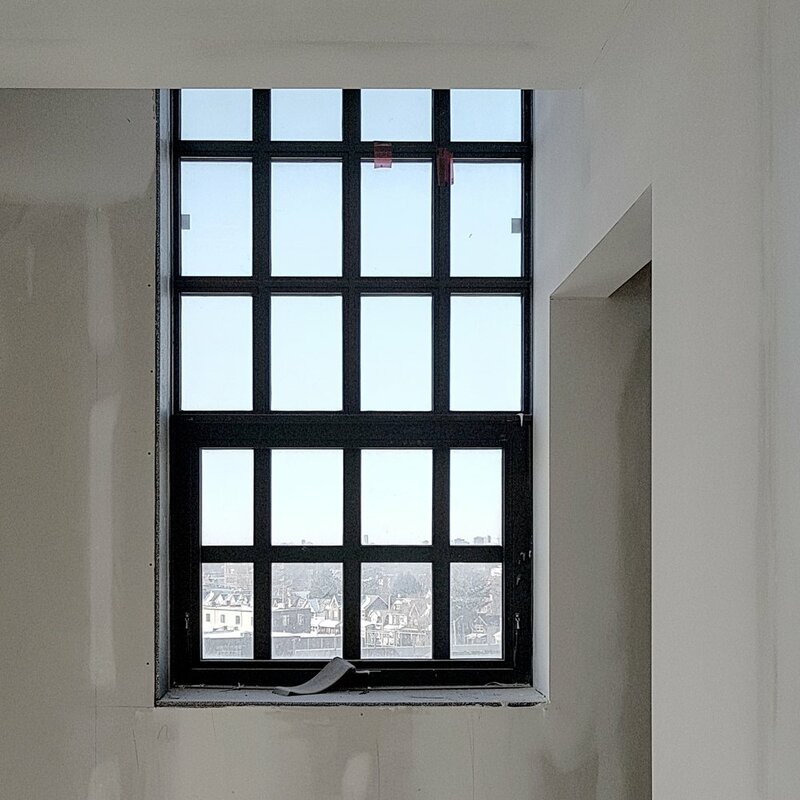 Drywall and interior glass installation has been completed on the fifth floor, which will house the Museum’s administrative offices and meeting room space. The installation of the second set of interior window glazing has been completed on the 2nd and 3rd floors. This second set of windows will ensure museum-standard climate control on the floors of the gallery where artwork will be displayed. The steel structure, that serves as the roof for two new glass additions along the west side of the building has been installed. These glass additions will connect to MOCA’s ground floor café and building lobby. On the main floor the original wooden doors are being reinstalled at the main Sterling Road entrance. We look forward to providing more information on this exciting element of the exterior work in our next construction update. Construction on the West Towns paused over the holidays but is again moving steadily forward, as weather conditions have permitted. Framing work for the townhouses has reached the third floor across almost two thirds of the site. Second storey framing is in progress on the southern part of the site. Framing work will continue at the south end of the site through the balance of this month. Work on the Auto Building’s adaptive reuse continues this month with a focus on finishing the interior spaces. Drywall and interior glass installation is moving ahead on the lower five floors that will house Museum of Contemporary Art Toronto. The studio and office spaces on the fourth and fifth floors are moving closer to completion. The installation of a second set of interior window glazing is almost complete on the 1st, 2nd and 3rd floors. This will ensure museum-standard climate control on the floors of the gallery where artwork will be displayed. The concrete structure for the exterior museum-standard freight elevator is now almost complete on the northwest corner of the building. The concrete roof of the exterior elevator is expected to be completed this month, as weather permits. This climate controlled exterior freight elevator will serve the first 3 floors of Museum of Contemporary Art Toronto. Also in progress are two new glass additions along the west side of the building, connecting to MOCA’s ground floor café and west building entrance. Steel is arriving in the coming weeks, which will be used to form the frame of these new glass additions. We look forward to providing more information on this exciting element of the exterior work in our next construction update. Construction on the West Towns paused over the holidays but is again moving steadily forward, as weather conditions have permitted. Framing work for the town houses has reached the third floor across almost two thirds of the site. Second storey framing is in progress on the southern part of the site. Framing work will continue at the south end of the site through the balance of this month. Work on the Auto Building’s adaptive reuse continued through the holidays. Gravel has been graded for what will be a new service lane encircling the Auto Building and connecting to Sterling Road. Also in progress, concrete has been poured on the west face of the building, where two new glass additions will be located, connecting to MOCA’s ground floor café and west entrance to the building. Steel is arriving soon that will be installed to form the frame of these new glass additions. Drywall and interior glass installation is moving ahead on the lower five floors that will house Museum of Contemporary Art Toronto. The studio and office spaces on the fourth and fifth floors are nearly complete. A second set of interior window glazing is being installed on the 1st, 2nd and 3rd floors, to ensure museum-standard climate control. The concrete structure for the exterior museum-standard freight elevator is now three-quarters complete on the northwest corner of the building. Concrete pouring for the exterior elevator will continue through this month, as weather permits. This climate controlled exterior freight elevator will serve the first 3 floors of Museum of Contemporary Art Toronto. Construction on the West Towns is moving forward at a steady pace. As with the earlier stages of construction, framing is progressing from north to south. Framing work of the townhouses has reached the third floor of the northern half of the site. Second-storey framing is in progress on the central part of the site. The southern end of the site will see framing continue into January. At this time of the year, weather conditions may slow progress. Municipal servicing work is expected to commence in the New Year. As soon as the schedule for this municipal servicing work is finalized, both a printed and digital notice will be circulated to the community prior to work commencing. In the first half of December work on the Auto Building’s adaptive reuse accelerated. Drywall installation continues on the lower five floors that will house Museum of Contemporary Art Toronto, with studio and office spaces taking shape on the fourth and fifth floors. Installation of the exterior museum standard freight elevator is well underway on the northwest corner of the building. Work on the elevator will continue through this month, weather permitting. This climate controlled exterior freight elevator will serve the first 3 floors of Museum of Contemporary Art Toronto. In order to ensure museum standard climate control, a second set of window glazing will be installed on all the windows on the 1st, 2nd, and 3rd floors. This work is expected to get underway this month. Work is in the very early stages to create a new roadway that will connect from Sterling Road and run north and south on the west side of the Auto Building. Also in progress, concrete is being poured on the west face of the building, where the Museum of Contemporary Art Toronto café will be located. Work on the Auto Building will continue through the month, except for statutory holidays and weekends. The West Towns are taking shape as significant progress has been made this month with the townhouses’ framing work. The exterior walls and interior spaces are becoming clearly visible. Work began earlier this month at the north end of the site and has now reached the halfway mark. Second-storey framing is well underway at the north end, with first-storey work in progress midblock. Framing work on the southern half of the site will begin in December and continue through the month, weather permitting. Municipal servicing work is expected to commence in the coming months. As soon as the schedule for this municipal servicing work is finalized, both a printed and digital notice will be circulated to the community prior to work commencing. Over the past month, work on the Auto Building’s adaptive reuse has continued to make significant progress. The roof is now fully sealed. Restoration work on the north face of the mechanical penthouse is complete, while work on the south face is progressing well. Drywall installation continues on the lower five floors that will be the new home of the Museum of Contemporary Art Toronto. A set of new windows has been installed on the west face of the Auto Building, which match the window treatments already installed throughout the building. Installation work for the exterior museum-standard freight elevator, along the northwest corner of the building will continue through December, weather permitting. This elevator will serve the first three floors of the Museum of Contemporary Art Toronto in the Auto Building. The climate controlled exterior freight elevator will permit exhibits to be easily loaded into the building. Also of note, the mural by Jarus, located on the west face of the exterior of the Auto Building, has been restored by the artist. Please note that the wooden structure pictured here is temporary and will be removed prior to the Museum’s opening. All concrete work on the West Towns is now complete. The next phase of work is now underway: framing the upper levels of the townhouses. This work has begun at the north end of the site and will continue within the rest of the block. All the on-site servicing including water and sanitary piping is complete and ready to be connected to municipal services. The Auto Building’s restoration is making strides, with sealing on the 10th-floor roof being substantially complete. Work is ongoing to connect the generator and air-handling units to the building’s systems. Work on the mechanical penthouse will continue through November. The installation of air ducts, wall studs and insulation continues throughout the building. Drywall installation continues on the lower five floors that will be the new home of the Museum of Contemporary Art Toronto. New windows have been cut for the west face of the Auto Building. The new windows will look identical to the window treatments already installed throughout the building. Installation work for the exterior museum-standard freight elevator along the northwest corner of the building will be ongoing through the month. This museum standard external freight elevator will serve three floors of the Museum of Contemporary Art Toronto. On the main floor, a concrete entrance ramp to permit accessible access to the entire Auto Building has been installed. 1. Why is the Museum Flats project being cancelled? We do not have a viable budget acceptable to Lenders and despite our best efforts, we have not secured all of the development approvals or available permits. 2.What were the approvals/permits that were not acquired? The site-specific Official Plan Amendment and Zoning Bylaw were finalized at the Ontario Municipal Board (‘OMB’) on May 27th, 2014 through a settlement process. The final order on the planning instruments was released by the OMB on August 11th, 2015 when the Section 37 Agreement was finalized and executed. Without the Draft Plan Approval, none of these necessary approvals are obtainable. We have been actively seeking approval of the Draft Plan of Subdivision application for a number of years. 3. Why was the project cancelled and instead of just delayed? Why is the project cancelled now when there is another year to notify purchasers? We know today that the budget will not allow the Museum Flats project to proceed. As time progresses, the cost numbers only get worse and our revenue is fixed. As soon as we knew the prospect of proceeding was no longer possible, given the circumstances, we let the Purchasers know. 4. I'm a purchaser. How am I just hearing about this? How do I get my money back? 5. What cost increases have caused the Project Budget to no longer be viable? The delay in planning approvals has caused the hard costs from the point of sale to date to increase by 13%. Recently, the industry has been experiencing the most significant cost increases in a decade. Projected Budget Soft Costs for the Museum Flats (all consultant costs and development fees and charges) will have almost doubled. Hard Costs are expected to increase by 8% over the next year. Our soft costs will also continue to increase over the next year until all the development approvals and permits are obtained. 6. Will the Museum Flats project be relaunched? If so, when? The Museum Flats in its current form and design cannot be relaunched. We will go back to the drawing board and determine the best possible way to get the entire Lower Junction project moving forward. We cannot proceed to market with this phase or any other residential phase without building permits being available. 7. What incentives, if any, will the Museum Flats purchasers be given for future residential development within the Lower Junction neighbourhood? We have had numerous conversations with disappointed Purchasers and we have stated that all Museum Flats Purchasers will be given a ‘first opportunity’ before any other party. This will come with a discount to be determined at the time. To be clear, we will not be relaunching Museum Flats, but whatever residential phase is put forward in the future within the Lower Junction project, this ‘first opportunity’ and discount will apply. We are pleased to announce that another milestone has been reached at the West Towns site with the construction of the lower levels of the townhouses now being substantially complete. The next phase of work on the upper levels of the townhouses is scheduled for November. In addition, municipal servicing work is expected to commence in the coming months. As soon as the schedule for this municipal servicing work is finalized, both a printed and digital notice will be circulated to the community prior to work commencing. The Auto Building’s interior restoration continues to make significant progress with the building’s generator and air-handling units now installed on the 10th floor roof. The installation of wall studs and insulation continues throughout the building. Drywall is being installed on the lower five floors that will be occupied by the Museum of Contemporary Art Toronto. The excavation for the exterior museum-standard freight elevator along the northwest corner of the building has begun. Installation work will continue throughout the month of November. This external freight elevator will serve three floors of the Museum of Contemporary Art Toronto. Work on the mechanical penthouse will continue through November. The restoration and sealing of the upper section of the building is nearing completion. There has been significant progress at the West Towns site. Construction of the lower levels of the townhouses has filled approximately three-quarters of the site. Forming work for the final section of the lower levels is now occurring on the south end of the site. Once this is completed, work will commence on the upper levels of the townhouses. Municipal servicing work is expected to commence in the coming months. As soon as the schedule for this work is finalized, both a printed and digital notice will be circulated to the community prior to work commencing. As work progresses, care is continually being taken to ensure there are no significant traffic impacts in the neighbourhood. The Auto Building’s interior restoration continues to make significant progress. Concrete polishing on the upper floors of the building has been completed except for the 10th floor. The installation of wall studs and insulation continues throughout the building. Drywall has begun being installed on the lower five floors that will be occupied by the Museum of Contemporary Art Toronto. 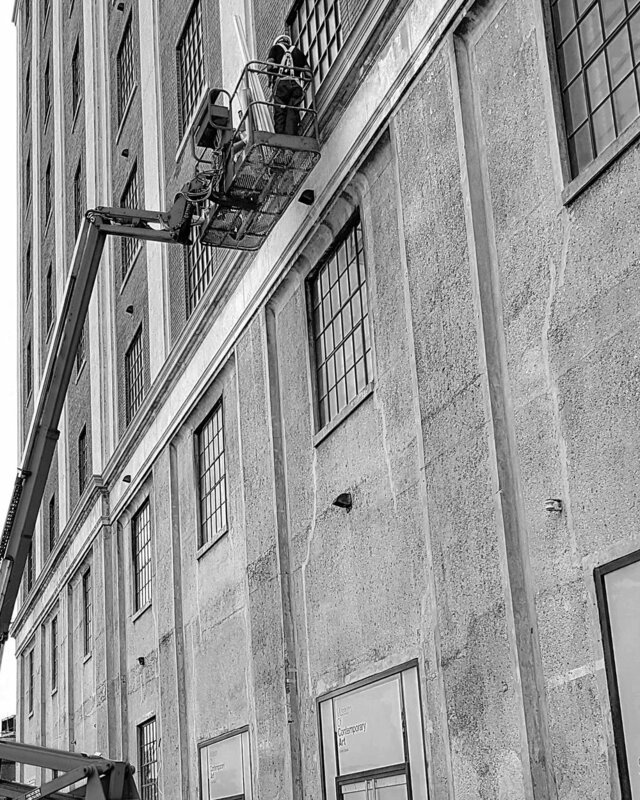 New windows are being cut for the west face of the Auto Building, which reflect the industrial heritage character of the building. Initial work to install the exterior museum standard freight elevator along the northwest corner of the building is expected to be underway in the second half of October. This elevator will serve three floors of the Museum of Contemporary Art Toronto. Work on the mechanical penthouse will continue through the balance of October, which includes restoration and sealing of the upper section of the building. Construction of the townhouses is progressing well at the West Towns site. At the north end of the site, crews continue to work on the lower levels of the townhouses. Forming work is moving from the north to the south, and is now more than half complete. Municipal servicing work is expected to commence later in the fall. A printed notice will be circulated to the community prior to work commencing and the information will also be posted at: http://www.lowerjct.com/updates. The Auto Building’s interior restoration made significant progress in September. The installation of wall studs continues throughout the building, including the floors that will be used by the Museum of Contemporary Art Toronto. Drywall is being delivered to the site and will begin to be installed on the lower levels. Air handling units, as well as hot water units, have been installed on several floors and remaining floors will have these units installed this month. Installation of ceiling lighting fixtures and the concrete sealing and polishing of the floors continues throughout the Auto Building. On the north exterior of the Auto Building, the storm water management tank has been completed. Preparation for the installation of the exterior freight elevator along the northwest corner of the building, which will serve three floors of the Museum of Contemporary Art Toronto, continues. The new topping (roof) on the south side of the top floor has been completed. Work on the mechanical penthouse will continue through the balance of October. Work on the basement level is progressing well. Looking ahead, we expect work to commence later this autumn on the proposed main floor glass additions, which will mimic the saw tooth lines currently seen on the west face of the heritage building. One of the glass additions will connect to an enclosed café area that the Museum will operate and the other will provide access to the lobby area that will serve the entire building. Both glass additions will front onto a new proposed publicly accessible plaza area. Construction of the townhouses is progressing steadily at the West Towns site. At the north end of the site, crews continue to work on the lower levels of the townhomes. Forming work continues - moving north to south on the site. Municipal servicing work is expected to commence within the next two months. A printed notice will be circulated to the community prior to work commencing. The Auto Building’s interior restoration work made significant progress in August. Electrical work and piping for plumbing services and sprinkler systems are being installed throughout the building. Piping for washrooms is largely completed. Air handling units, hot water units and associated piping has been installed on several floors and the rest of the floors will have these units installed within a few weeks. Installation of ceiling lighting fixtures and the concrete sealing and polishing of the floors is taking place throughout the heritage building. The roofing for the skylights (north lights) that will cover the northern section of the 10th floor has been installed. Glass installation and further work on the mechanical penthouse is set to get underway in early September. On the north exterior of the Auto Building, the storm water management tank has been completed. Preparation work is set to begin this month for the installation of the exterior freight elevator along the north elevation, which will serve three floors of the Museum of Contemporary Art Toronto. Cut outs on the west face of the building on the main floor have been completed. The cut outs will support two new glass additions, which will mimic the saw tooth lines currently seen on the west face of the building. One of the glass additions will connect to the enclosed café area that the Museum will operate and the other will provide access to the lobby area that will serve the entire building. The glass additions will be adjacent to the new outdoor publicly accessible plaza area immediately west of the Auto Building.